Fun fact! Before KJ Apa blessed our screens as Archie on the CW's Riverdale, he was known in his native New Zealand as a soap character named Kane Jenkins. KJ appeared on a show called Shortland Street and, as a result of this, there are tons of amazing videos of his soap days floating around online. Now, if you have a friend like Cole Sprouse, there is a very decent chance that he will rejoice in digging up your old acting credits. Sure, Cole has Suite Life Of Zack And Cody, but unearthing this particular soap opera credit is pure gold. Cole posted a screenshot to his Instagram stories of an old Kane Jenkins X Ed Sheeran scene with the caption "Still Jenny from the block". 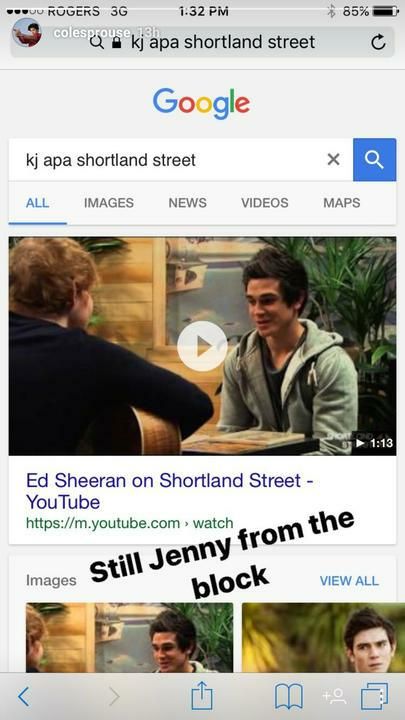 Ed Sheeran appeared on Shortland Street in 2014 opposite a fantastically baby faced KJ Apa. Not only is KJ a baby here, but his dark hair is clearly thriving. This is right at the cross-section of our pop culture interests so PLEASE ENJOY. Like some kind of red haired guardian angel, Ed Sheeran shows up, offers KJ's character some guitar tips, and then quickly exits the scene. A cameo for the ages.